← Does your camera enhance or interfere with life? I just don’t know what to think about Tim Tebow. The Denver Broncos quarterback is all the rage, especially after winning his first NFL playoff game yesterday in divine style. Tebow mania has grown to be a polarizing phenomenon due perhaps to his outspoken faith, his “unconventional” play, and his undeniable fame…and it’s got folks on both sides hugely passionate. It seems you either love him or you hate him. But I’m somewhere in between. I just can’t seem to get on the Tebowing bandwagon, but I also find it hard to dislike the guy. I’m not one of those who believes that The Man Upstairs is in your huddle to the exclusion of the other team, so the whole “Tebowing” thing is just not my style. And I tend to cringe a little inside when I hear players “thank the Lord” for their athletic skills or give Him the glory for their last-second field goal. Sorry, I just can't get on the Tebowing bandwagon. However, I am prone to support underdogs, which Tebow most certainly is. He seems to be a guy who can only get better, because truthfully, he’s not that great in the skills department. He’s not a run-first quarterback in the spirit of Randall Cunningham or Michael Vick. No, he’s more a throwback to the old leatherheads who ran because their passes look like wounded ducks. Despite that, he is managing to win games, so you can’t help but notice. And he has shown stretches of greatness. When he hit Demaryius Thomas for the winning 80-yard pass-and-catch in overtime, it gave him 316 yards passing, and a 31.6 yard-per-pass average against the Steelers. 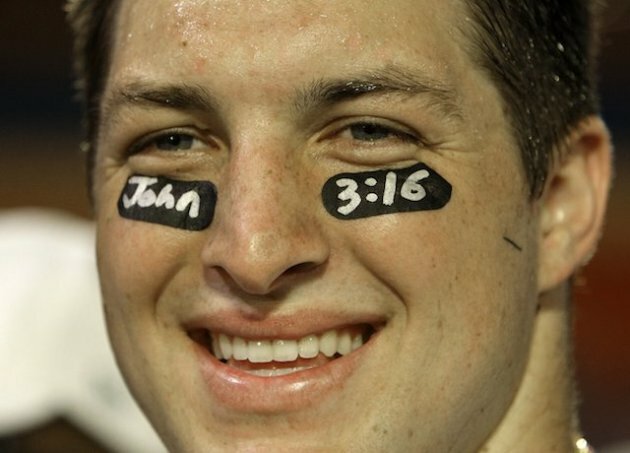 Those are great numbers, but what has Twitter all a-flutter is the eerie coinky-dink to the biblical John 3:16 passage, a number which Tebow famously wore (as do many other athletes) in black under his eyes when he led the Florida Gators to victory in the 2009 national championship game. Twitter later announced that 9,420 tweets per second were sent immediately after the winning play, setting a new sports record for the social media site. 3:16 is not how much time is left in the 4th quarter. Having worked in a professional sports league myself, I can appreciate the value of ratings, talent, and hype – and these are most certainly coalescing in the NFL playoffs, thanks in large part to Tebow’s success. The Broncos-Steelers game pulled in a huge 25.9 rating for CBS, becoming the highest-rated AFC wild-card game since 1988. Even more crazy, the final quarter-hour rating for the game was, you guessed it, 31.6. If Tebow and his divinity can find a way to dethrone Tom Brady and the heavily-favored New England Patriots next week, prepare for even more Tebow mania as he continues to win over admirers and fans everywhere.